The beautiful township of Willunga and the gorgeous Fleurieu Peninsular, South Australia. 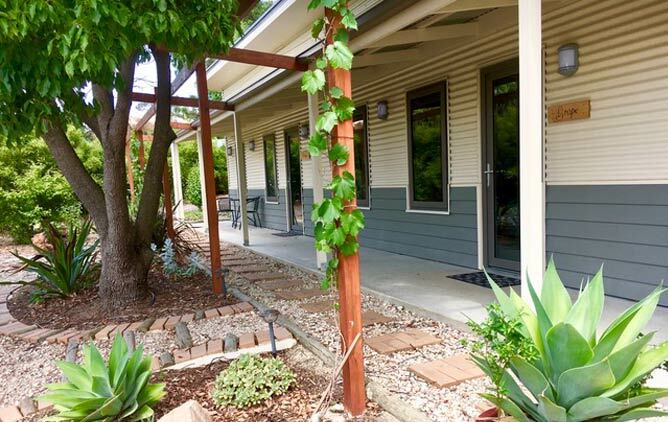 We are situated in the heart of Willunga just an 8 minute walk from the markets, pubs, cafes and shops. The Grape and Olive offers the perfect get away for couples, families and groups. Just a 10 minute drive away from the beautiful Port Willunga Beach and 10 minutes from McLaren Vale. We are perfectly located to visit the world class local wineries. Discounts available for families renting both units utilising the interconnecting double doors. All prices are based on 2 people sharing & are inclusive of linen and cleaning. Breakfast provisions available at an additional $10 per head per night, including locally sourced eggs, bacon, sausage & bread. We thoroughly enjoyed our stay at The Grape & Olive. We stayed at the "Olive" accommodation for one night and we could have easily stayed longer. It was very comfortable and relaxing. All the little touches of home were added and we paid a little extra to indulge in their lovely breakfast. Well worth it. We will definitely be back and have already recommended to friends. Facilities were very nice and clean everything you would need was provided. Good value breakfast option. Walking distance to main street with cafes and shopping. Very convenient to McLarenvale and Lecondfield Wines if attending a Day on the Green concert. Beautiful place, everything we needed. Clean, comfortable and very fresh - would highly recommend the property. Wished we could have stayed longer. Being the first visitors we enjoyed our stay and appreciated the attention to detail of the construction. Thank you very much and we will certainly be back. Hadrian and Halina - Victoria.